I intended to write you soon after election, but I was tired, and put it off. I came away from New York a few days after election and came home here to hunt, and rest, and forget “Headquarters”. I heard you tell a story once about a “close race”, and we saw one like it. I can’t say that I was disappointed, - I really didn’t “care a button” whether Hughes won or not. I worked hard to do the things I had to do as well as I could, but he had around him a poor bunch, an unattractive lot, and he himself seemed to me cold, selfish, and unappreciative - I couldn’t enthuse a bit. I saw a lot of the Colonel - was down to luncheon once, went with him to Battle Creek, Michigan, and to Wilkes-Barre - and to Oyster Bay to see him about speeches three times - thats about all the memories of the campaign that will keep a pleasant corner in my brain - I think the Democrats outplayed our men at every angle, and, I think, (though many good judges say “no”) that Mr. Hughes was a decidedly weak candidate. I think any man who loses Utah that (“G”) Mr. Taft carried, and all the far west (saving Oregon) is weak - But at that, he probably got more votes than any other Republican could get. I remember you told me one night - (when Pence was very low) that his phrase “Peace and Prosperity” would be hard to beat. That was long before the primaries, even. You were right - It couldn’t be overcome - High wages, high prices for the farmers, no war, was unbeatable, and I think will always be. And in addition the Western Progressives did not support Hughes; they voted very largely for Mr. Wilson - And I believe this election tells us one thing most forcibly. And that is that, in our time, at least, no Republican or Democrat can be elected President unless he is actually a Progressive - So much for politics; we will have a few hours our truce when I get down, and I hope to soon, - right after New Years. I've written Riggs, and I think he and I will take a little place together - I hate trying it alone - I had enough of that, after you left last May. The weather has been ideal here until the last few days. I have been in the woods nearly every day. Hunting is good here - woods of rabbits, birds and foxes. I saw Mr. Parkhurst on the train a few days ago. He looks very well. He is going down to see you, he says. His daughter, (about 16) is in Elmira at school, and saw you there with the President. I saw Captain Berry a few times during the campaign. I hope “Arch” is well. I feel like a dog - I’ve never written him since I left. Once in a while I have a note from Dr. Fox. And thats about all I hear from Washington. Give my affectionate regards to the sweet, gracious Lady Grayson, and for you both I wish from the bottom of my heart a Happy New Year, and many, many of them. 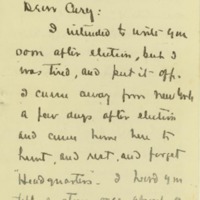 Murray, Lawrence O., 1864-1926, “Lawrence O. Murray to Cary T. Grayson,” 1916 December 25, WWP21021, Cary T. Grayson Papers, Woodrow Wilson Presidential Library & Museum, Staunton, Virginia.